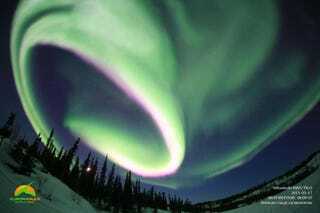 While beautiful, auroras can also be the harbinger of the collapse of civilization. If a sufficiently large flare and coronal mass ejection spawns a massive solar storm that hits the Earth, the geomagnetic storm could be capable of knocking our electrical infrastructure offline for a long, long time. Flares are classified on a logarithmic scheme, as so many natural disasters are. The measurement is the peak flux of X-rays measured by the GOES-15 satellite in geostationary orbit over the Pacific. The X-class is the highest class of flare, but they start at X1, and work their way up in intensity. Anything over X9 is a "super X" flare: the largest ever recorded was an X28 in 1976, and that might be an underestimate. Massive flares can be directly troublesome by producing radio blackouts, and bigger flares are more likely to produce magnetic reconnection — the abrupt rearrangement of the sun's magnetic field — and thus in turn, trigger coronal mass ejections. But the serious hazard is the geomagnetic storm caused by the interaction of the sun's charged particles and our planet's magnetic field. Our sun is an active star undergoing stellar fusion, with scorching hot plasma generating powerful magnetic fields, tangling in sunspots and flares. While it cycles between more and less active times, getting smacked by a massive solar storm that takes out our electrical grid is a question of "when," not "if." The last major storm hit in 1859, producing auroras as far south as Mexico, with a smaller event in 1989 messing with Canada's power grid. More recently, we had a near-miss in 2012. Since it was a miss, who cares? Because the most effective and efficient form of hazard mitigation is through education, awareness, and preparation. The world would be a grim, dark place if we globally lost power for 4 to 10 years. We can't stop the storms from coming. But we can pressure policy-makers, politicians, and companies into preparing for it by hardening the electrical grid. Canada already learned this lesson, spending $1.2 billion to harden the power system that was damaged in 1989. But it doesn't need to be that expensive to mitigate the problem a least a tiny bit: According to a 2013 report for the insurance industry, it would only cost $100 million to protect the most vulnerable transformers on the grid in the United States. Sure, that's more expensive than we could cover with bake sales and crowdfunding, but it's a lot less expensive than doing nothing and facing a technological Armageddon if the next storm hits us. It would cost just $100 million, less than the cost of a 30-second Super Bowl ad, to keep from knocking out the entire US electrical grid for a decade when a major solar storm hits the Earth. Is it worth it? Only if enough people think it is, and demand we spend money to prepare.